tri. Part 6 Theater Gift Images! Plus a Previously Unnanounced Bonus Gift! Thread: tri. Part 6 Theater Gift Images! Plus a Previously Unnanounced Bonus Gift! We got an announcement of the theater gifts just a week and a half ago! 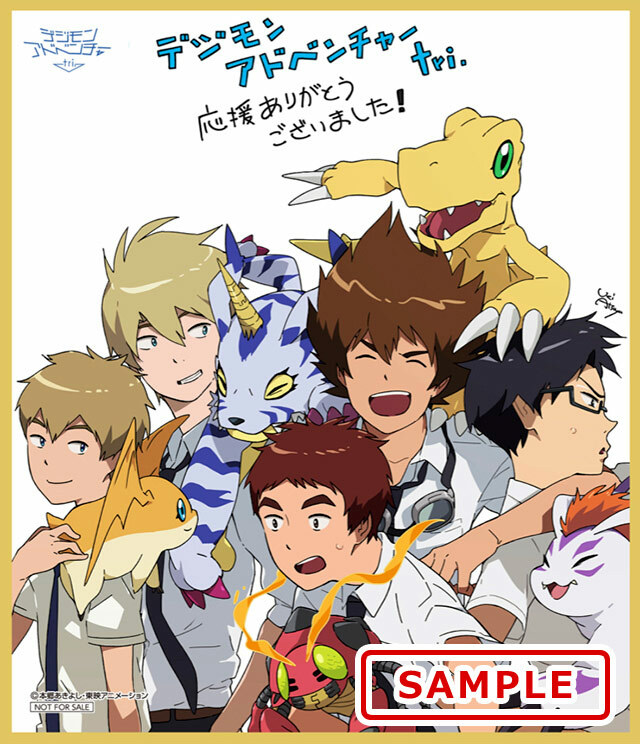 Now we finally have images of the theater gifts for people who see Digimon Adventure tri. Part 6 when it begins it's limited run in theaters. Like previous theater gifts, these will have limited stock and once they are gone, they're gone. Week 1's (5/5 thru 5/11) gift (pictured above) will be a postcard featuring the 2nd tri. Part 6 theatrical poster art. Week 2 (5/12 thru 5/18) will be postcard sets featuring production artwork. Each set features 3 postcards. Sets will be given out randomly. Set A features Taichi and Agumon, Agumon, and Omegamon Merciful Mode. Set B features Yamato, Gabumon, and Holydramon. These have fantastic art of all the characters with one featuring the boys and the other featuring the girls. Some amazing art from Uki Atsuya for this gift. It's a great theatrical gift for the final 'standard' week of tri. 's theatrical run. The shikishis say "Thanks for all the support!" An Ordinemon promo card for the Battle Spirits card game! 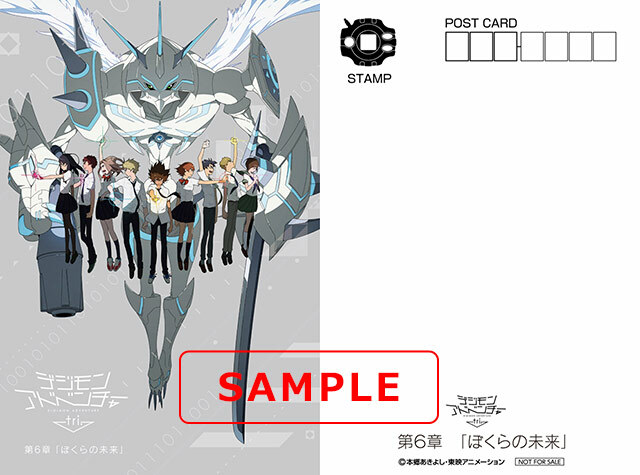 This will be a bonus gift given to the first 100,000 people who see Digimon Adventure tri. Part 6 in theaters. No official announcement yet of other items, but they've generally had gifts ready for additional weeks when they announce tri. will run longer than originally announced. The prior thread about the theater gifts is here. Update- Added a translation of the message on the shikishis thanks to shin. woah ordinemon looks really cool on the promo card! Btw what was that unknown item revealed for part 5? It was a Raguelmon Battle Spirits card. A separate promo card was an Ophanimon Falldown Mode card, given out at some Battle Spirits events the same day tri. Part 5 (and the Raguelmon promo card) came out. Kind of neat that the day of Part 5's release we had Raguelmon and Ophanimon FM promo cards, and the day of Part 6 we have an Ordinemon promo card. oh my these look amazing!! i hope the international theatrical release gets the same thing. though since we only had like one day runs i wonder which of those they would give out. I really like these gifts. I will have to try and buy them if they're not to expensive. Shame that the English dub release isn't doing anything like this with the Blu-Ray and DVD. 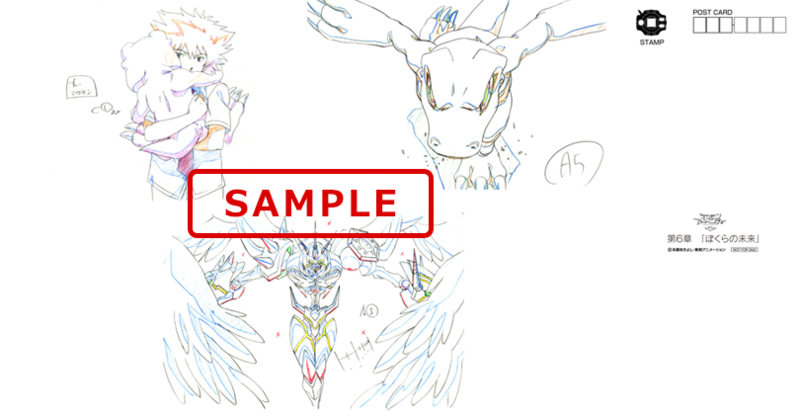 The production art is great; I love that Agumon is in a similar pose to Omegamon. 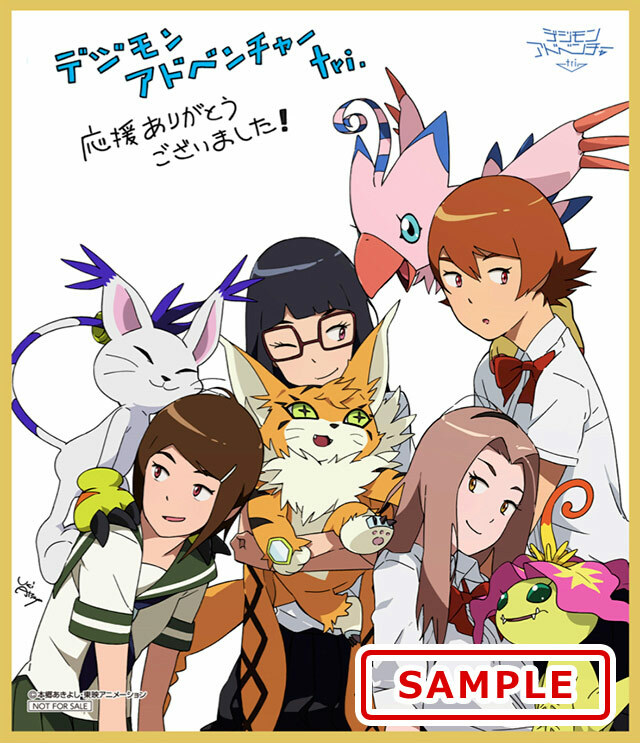 The colored art is great as well--it seems like they've really been making Tailmon more and more cat-like in her poses. It's adorable that she's rubbing Hikari's head. About Ordinemon...are those pointed purple things to the sides of her similar to the type of lances Junomon Hysteric Mode has, or are they more like claws or parts of the wings? Ordinemon is all colors and primarily purple, huh? No surprises there, I guess. 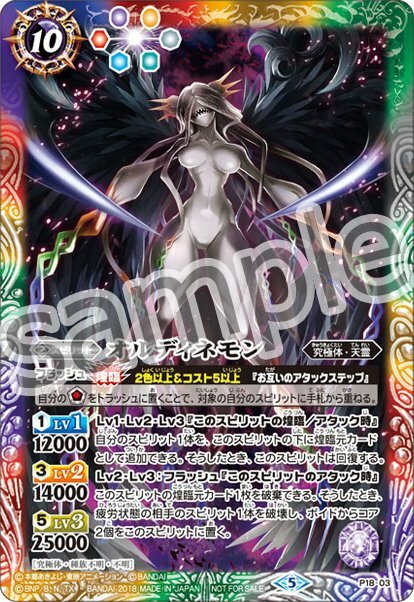 Her Battle Spirits family (besides Ultimate) is Heaven Spirit, which she shares with Angemon, Angewomon, HolyAngemon, and Ophanimon Fall-Down Mode. You sure do get a lot of nice stuff just for going to see a movie. ...And paying for some of it. heh heh But still that stuff is nice. 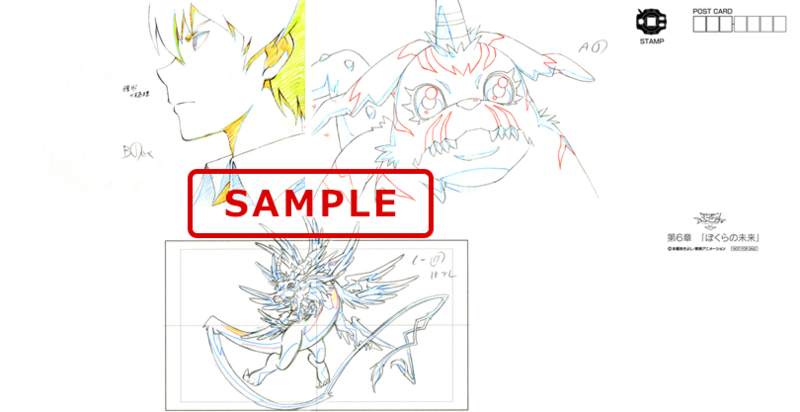 Meicoomon looks so kawaii in the shinkishi board...It's so hugable :3 And Ordinemon well...as hideous as expected, but the artstyle looks amazing though!